In 1714, 22-year-old Elisabetta Farnese was bequeathed to marry Philip V of Spain. Elizabeth was the heiress of his uncle-stepfather, the Duke of Parma. Her father was the Duke's younger brother. After her father's death, her mother, Dorothea, married Francesco, the Duke. With no immediate male heirs, it was decided that the Duchy of Parma should pass in the female line. At the time of Philip and Elizabeth's wedding, Spain was economically battered due to the 14-year War of the Spanish Succession. The treasury was nearly depleted and the Spanish was crown was faced with a problem: where to get a suitable dowry for the new queen? From the colonies, of course, the government officials thought! Words were dispatched to colonial governors, ordering them to send wedding gifts to Madrid, French journalist and historian Vincent Meylan writes. Thus, the year-long search for precious gifts for Elizabeth began and it was not until 1715 that the treasures were sent to Spain. The Golden Fleet sailed from Cuba in August, with 12 ships carrying hundreds of gold bullion and a case of emeralds. Alas, the fleet was smashed by a hurricane in the Gulf of Florida with only one ship escaping the storm’s wrath. Heaven knows what happened to the emeralds. Legend has it that they were lost in the sea. Only the pear-shaped blue diamond, a gift from the Philippine islands, reached Spain. The governor that time was Martín de Ursúa y Arizmendi, who died in the Philippines that year, shortly before the Philippines' gift finally reached the Queen’s hands. The choice for Elizabeth couldn’t be more magnificent! Blue diamonds were considered as the ultimate royal gift and these diamonds were believed to be mined in the Golconda mines of India. Until the discovery of diamonds in Brazil in the 1720s, India was the only known source of diamonds that time. The diamond, together with the Duchy of Parma, was passed on to Elizabeth’s younger son, Philip, who succeeded as Duke of Parma. It remained in this branch of the Bourbons. 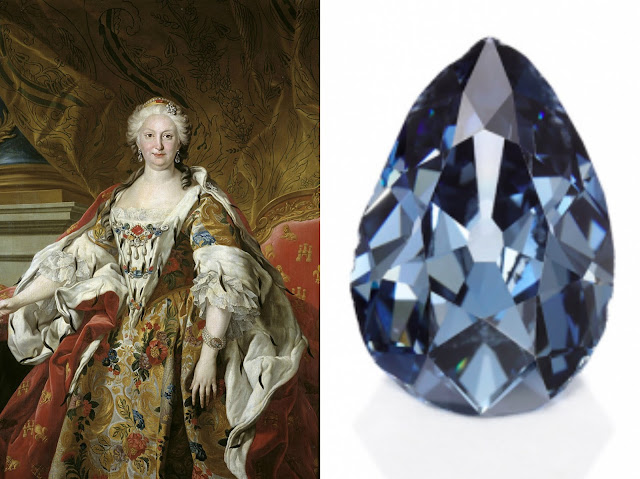 When Robert I, the last Duke of Parma left Italy forever, he brought with him to Austria the treasures of the house of Farnese, including the blue diamond. It was then kept in a box with a silver plaque that explains its provenance. It reads in French: “Remarkable blue brilliant. 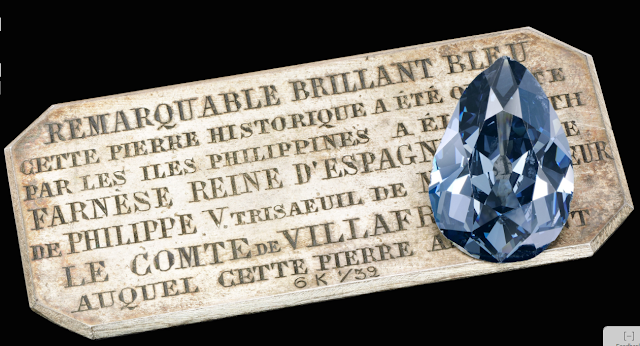 This historical stone was offered by the Philippine Islands to Elisabeth Farnese, Queen of Spain, wife of Philippe V, great grandfather of the Comte of Villafranca, current owner of that stone.” The Comte of Villafranca was the former Charles II of Bourbon, Duke of Parma. He was Robert’s grandfather who abdicated 1849 following the 1848 Revolution. He known as Comte of Villafranca since then until his death. His son and Robert’s father, Charles III succeeded as Duke of Parma but was murdered in the streets of capital in 1854. When Robert died, the diamond was probably inherited by one of his sons from his first wife. The son, Prince Elie, married Archduchess Maria Anna of Austria in 1903. The archduchess meticulously prepared a jewellery inventory, which mentioned a diamond tiara that was once in the possession of Queen Marie Antoinette of France, inherited by Madame Royale, Duchesse d’Angoulême (1778-1851), and passed on to her niece, Louise of France, Duchess of Parma.That was how the tiara came into the House of Farnese. At a certain point, Maria Anna explained that the blue diamond was mounted on the tiara, which she wore when attending the glittering balls of the Habsburg court. Since the downfall of the Austrian Empire in 1918, the blue diamond disappeared into oblivion until news of its auction by Sotheby’s placed it once again in the headlines. Perhaps, the auction is one of those rare moments when the diamond can be viewed in public. The 6.16 karat-diamond is expected to fetch as much as £5 million this May.